It’s starting to feel real. Both Boeing Co. and Elon Musk’s Space Exploration Technologies Corp. have contracts with NASA to fly astronauts to the International Space Station as part of what’s known as the Commercial Crew Program. Seven years after the end of the Space Shuttle program, NASA introduced the astronauts who will fly with both companies. Demo-1: SpaceX will conduct an uncrewed demonstration mission without humans aboard known as Demo-1. The Crew Dragon spacecraft assigned to Demo-1 underwent thermal vacuum and acoustic testing at NASA’s Plum Brook Station in Ohio and arrived in Florida last month. Demo-1 is currently targeted for November. In Flight Abort Test: SpaceX will demonstrate its ability to swiftly carry the Dragon capsule to safety in the event of an in-flight mishap with the Falcon 9 rocket. There won’t be astronauts on board for this test, which will be conducted from Launch Complex 39A at the Kennedy Space Center in Florida. Neither NASA or SpaceX has named a target month; early next year seems likely. Demo-2: Following Demo-1 and the abort test, Air Force Colonel Bob Behnken and former Marine Corps test pilot Doug Hurley will be the first two astronauts to fly in Dragon, which will launch from Kennedy Space Center. 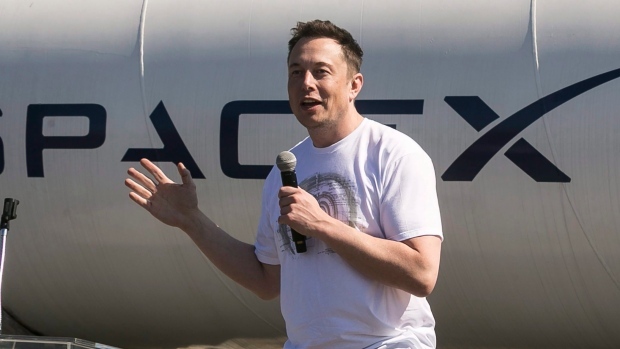 Hurley, who has been with NASA for 18 years, said he’s thrilled with the white space suits SpaceX designed—if you watched the Falcon Heavy launch in February, the dummy “Starman” was wearing one behind the wheel of Musk’s cherry red Tesla Roadster. “The old space suits are really heavy,” said Hurley. “SpaceX started from scratch and built this in house. It’s pretty neat looking. I’ve worn the suit over 20 times already, and it’s lighter and a lot more comfortable to wear.” Demo-2 is currently targeted for April 2019.Though SpaceX and Boeing are in a race to see who will get astronauts to the ISS first, both companies, as well as NASA, said they are focusing on safety over schedule. “We are not going to fly until we are ready to fly safely,” said SpaceX Chief Operating Officer Gwynne Shotwell at the event Monday. “We need to hit all the boxes and do everything we need to do to take astronauts from U.S. soil as often as NASA will let us.”After SpaceX successfully completes Demo-2, NASA will certify the spacecraft and systems for regular crewed launches to the ISS, with astronauts Mike Hopkins and Victor Glover flying the first operational mission.